A factory worker performs diagnostics on a Passat before it is taken through a dyanometer in the assembly section of the Chattanooga Volkswagen Plant in Chattanooga, Tenn.
A new study on works councils by the U.S. Chamber of Commerce says the type of employee panels popular in Europe and being considered at Volkswagen's Chattanooga plant isn't legal in the United States. "Overall, the evidence is clear that a works council contradicts the most fundamental aspects of U.S. labor law," said the report by the U.S. Chamber. Glenn Spencer, vice president of the Chamber's Workforce Freedom Initiative, said the concept of works councils is not compatible with American law. 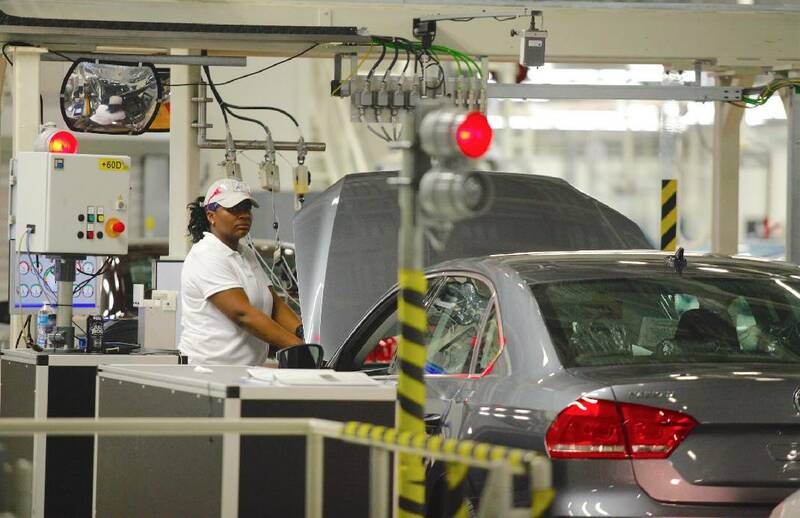 POLL: Should UAW represent Volkswagen? Chattanooga's Volkswagen plant is visible in this file photo. The UAW logo is displayed on the podium at a news conference on July 20 in Chattanooga. "The structure of a works council in Europe doesn't comport with how things are done here," he said. VW officials have touted the benefits of works councils, which exist at nearly all of the German automaker's plants worldwide, but not in its Chattanooga facility. VW officials have said a union is needed to institute a works council, which is a panel of blue- and white-collar employees who talk with the company about issues such as safety, training and scheduling. The United Auto Workers, which is trying to organize VW employees in Chattanooga, has said it supports the idea of a works council at the plant. However, the U.S. Chamber report said that with unionization rates below 7 percent nationally, it's understandable that unions are looking for new organizing strategies. The Chamber said that "the reality is that there are significant legal obstacles that make this an impractical solution." Mike Cantrell, president of UAW Local 42, said the union and VW worked together in 2014, with advice and counsel from multiple business and labor attorneys who are experts in state and federal laws, to collaboratively develop a works council concept for Chattanooga. "Clearly, both the union and the company believed the concept was compatible with state and federal laws, aligned with the UAW's policies, and consistent with the company's unique brand of co-determination between management and employees. The U.S. Chamber is unfortunately mistaken," he said. Maury Nicely, a spokesman for a competing union at the VW plant, said the aim is to get as close to a works council at the plant as possible under U.S. law. "To me the goal is to get as close as you can without violating U.S. labor law," said the American Council of Employees spokesman. A VW spokesman had no comment. The Chamber report said the UAW claims it would delegate to the works council certain duties ordinarily carried out by unions. But the report said U.S. law prevents unions from delegating any of its representational duties to a works council. Also, the Chamber said that an employer dealing directly with a works council rather than the certified union representative would be engaged in "bad faith bargaining." "If a union is certified as the exclusive representative, and the employer deals with employees though the works council rather than through the statutory representative, that may constitute direct dealing in violation of labor law," the report said. The UAW said VW leadership at the plant and in Germany believe a union partnership is the only legal path for establishing a works council. It cited a notice sent to VW employees in September 2013 from then-plant manager Frank Fischer and Human Resources head Sebastian Patta stating that: "In the U.S., a works council can only be realized together with a trade union."